Green Card Lottery Online Help, Questions and Answears on most common issues. What is the Green Card Lottery Program? Who can participate in the lottery? What about my spouse and children? Is there a minimum of age to apply? What are the requirements for the education or work experience? 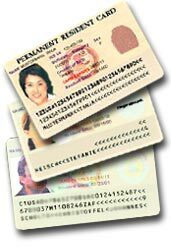 Why do natives of certain countries not qualify for the green card lottery? What can I do if I was born in a country that is not qualified? How many applicants will be selected? Can I do something to increase my chances to win? How many visas are distributed to each country? I live in the U.S. - Can I participate? May a husband and a wife each submit a separate form? If I win, do I have to travel with my family? What information is required to fill in the application? What family members must I include on my entry? Is the photograph required for each family member? Are there any specific formatting requirements for the entry, envelope, photos etc? Who is USA Diversity Lottery? How much time does it take to complete the process? Can I call USA Diversity Lottery? The Green Card is an immigrant visa to the United States. It allows you to legally live, work and study in the United States and to enter and leave the country freely. Green card holders also receive health, education, and other rights, and they can sponsor relatives for Green Cards. The Green Card Lottery program is formally known as the Diversity Immigrant Visa Lottery Program and is administered by the US Department of State. The program makes available permanent residence visas (Green Cards) to persons meeting certain eligibility requirements. Winners of the lottery are chosen in a random drawing conducted by the US State Department. If you win and obtain a Green Card, your spouse and unmarried children under age 21 may submit documentation to receive Green Cards as well. There is no minimum age to apply for the program, but the requirement of a high school education or work experience for each principal applicant at the time of application will effectively disqualify most persons who are under 18 years old. You must have at least a high school education or its equivalent or, within the past five years, have two years of work experience in an occupation requiring at least two years training or experience. A "high school education or equivalent" is defined as successful completion of a twelve-year course of elementary and secondary education in the United States or successful completion in another country of a formal course of elementary and secondary education comparable to a high school education in the United States. Occupations that require at least two years of experience are determined from a list published by the Department of Labor. The Do I Qualify page will walk you through these options. Diversity visas are intended to provide an immigration opportunity for persons from countries other than the countries which send large numbers of immigrants to the U.S. The law states that no diversity visas shall be provided for "high admission" countries. These countries are those from which a total of 50,000 persons in the Family-Sponsored and Employment-Based visa categories immigrated to the United States during the previous five years. You can claim nativity through spouse or parent (subject to certain limitations). The Do I Qualify page will walk you through these options. There are 55,000 visas available, but more than that number of individuals will be selected. Because it is likely that some of the first 50,000 persons who are selected will not pursue their cases to visa issuance, selecting a larger number of entries should ensure use of all numbers, but it also risks some selected persons being left out. Therefore it is very important that if you do win, you proceed to process your visa immediately. Random selection by the Kentucky Consular Center computer does not automatically guarantee that you will receive a visa. Only ONE entry form may be submitted by or for each applicant. ALL entries by an applicant will be disqualified if more than ONE entry for the applicant is received, regardless of who submitted the entry. However, married couples may each submit an application, doubling their chances to win. The Register page will automatically suggest this to you. Yes and No, all qualified entries are randomly selected by computer and have an equal chance to win, however if you are married you and your spouce can both apply and you will double your chances of winning. What you can do is make sure that your application is not disqualified. Each year millions of applications are disqualified for failure to follow the submission requirements. The online Register page will create the application for you and help you avoid this. Visas are distributed among six geographic regions with a greater number of visas going to regions with lower rates of immigration, and no visas going to countries sending more than 55,000 immigrants to the U.S. in the past five years. No one country can receive more than seven percent of the available Diversity Visas in any one year. Yes, a husband and a wife may each submit one entry. If either were selected, the other would be entitled to derivative status.Therefore, you may double your chances by submitting one application for each of you an listing each other as spouses or save a little and use our husband/wife appliacation that does the same for a less money. No. The fact that you have listed family members on your entry does not mean that they later must travel with you. They may choose to remain behind. However, if you include an eligible dependent on your visa application forms whom you failed to include on your original entry, your case will be disqualified. Those selected will be notified by mail between May and July each year and will be provided further instructions on how to claim their Green Card, including information on fees connected with immigration to the U.S. Persons not selected will NOT receive any notification. You are required to provide the name, date and place of birth of yourself, your spouse (wife or husband) and your children (unmarried under 21 years of age); your full mailing address; recent photographs of yourself, your spouse and children and to sign the form. The online Do I Qualify page page will walk you through all of the information you need. You must list your spouse, that is husband or wife, and all unmarried children under 21 years of age, with the exception of a child who is already a U.S. citizen or a Legal Permanent Resident. You must list your spouse even if you are currently separated from him/her. However, if you are legally divorced, you do not need to list your former spouse. For customary marriages, the important date is the date of the original marriage ceremony, not the date on which the marriage is registered. You must list ALL your children who are unmarried and under the age of 21 years, whether they are your natural children, your spouse's children by a previous marriage, or children you have formally adopted in accordance with the laws of your country, unless a child is already a U.S. citizen or Legal Permanent Resident. List all children even if they no longer reside with you. The online Do I Qualify page will walk you through all these requirements. Yes. You have to include a photograph of yourself, your spouse (wife or husband) and each child listed on your application. Are there any specific formatting requirements for the entry, envelop, photos etc? Yes there are � the Photo page and instructions will guide you through these requirements. The USA Diversity Lottery service was set up to provide information about the Diversity Visa Lottery Program and assist individuals with preparation of their application forms. Each year, millions of applications are disqualified because they fail to meet the strict submission requirements. The Check if You Qualify page walks you through the eligibility requirements making sure you provide all of the required information. How much time does it take to complete the online registration process? The entire registration process should take about 5-10 minutes. How much does the online service cost? The administrative fee is based on the number of entries you sign up for - in order to increase your chances if you are married we suggest you should submit either separate applications for yourself and your spouse or a combined husband/wife application (the Register page will automatically suggest this and other options). You may also register for automatic resubmission for the upcoming years � each year, new submission instructions are posted by the US Government. If you select this option, the service will automatically check and create your application in compliance with the new instructions. However, you will need to resubmit your photo each year to make sure the most recent photo of yourself is submitted. No. The only fee you pay to www.USADiversityLottery.com is the initial administrative fee when you sign up. Generally due to highly detailed nature of questions, all customer service inquiries are handled in writing and by e-mail. Enter the Green Card Lottery. 55,000 Green Card’s Must Go Each Year. Let us help you reach your dream of becoming an American resident today! Take the free test to see if you qualify. If you do, apply for the USA Diversity Visa Green Card Lottery here on the Official USA Diversity Lottery site and your dreams may soon come true. Take the free green card test. If you have any questions or any concerns, please contact our USA immigration experts and they will be happy to help you. We are her for you to make sure that you have the best possible chance of winning your USA Diversity Lottery Green Card.